A blog for the modern homemaker! 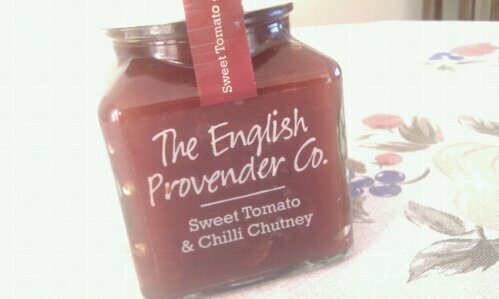 *When the lovely folks at the English Provender Company asked if I would like to try a jar of their all natural Sweet Tomato and Chilli Chutney for a review, I jumped at the chance to do so! Anything that is foodie and contains no artificial ingredients at all scores highly in my opinion. Suitable for vegetarians and vegans, the deliciously zingy Sweet Tomato and Chilli chutney boasts a list of natural ingredients that include tomatoes, apples, roasted tomatoes in olive oil, sultanas glazed in sunflower oil, and organic sea salt amongst others. They also use an open pan method of cooking which is a fairly slow process but one which reduces the ingredients down to a spectacular flavour and aroma that when I opened the jar to sample it, after a few minutes, the husband walked in wondering what I was cooking! The first bite of the chutney on it’s own is nice and sweet which then develops into a sensational yet a ‘not too hot’ chilli and tangy taste. We tried ours with a pork pie (or two), breadsticks, and thick cut baguette with a mature cheddar cheese. I also sent the husband off to work with a ham and sweet tomato and chilli chutney sandwich! At the moment, in the major supermarkets, you can find their Sweet Tomato and Chilli Chutney, Caramelised Red Onion Chutney and Ploughman’s Plum. The jars are clear with transparent labels so you can see the rich colours of the ingredients. You can also buy other delicious chutneys such as Moroccan Spiced and Apple, Pear and Fig from their online store along with ideas and recipes. 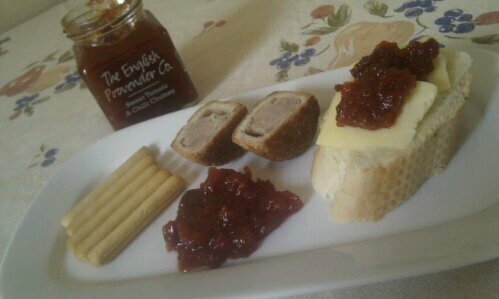 Visit English Provender Company to see their scrumptious ranges of chutneys and condiments and you can follow them on Twitter A Good Dollop and like them on Facebook too! for chances to win your own chutneys. *All my own words and opinions. 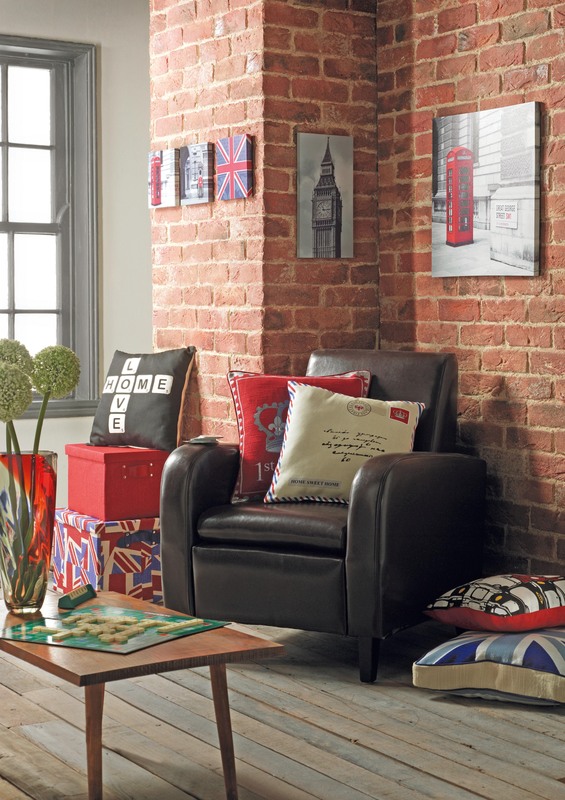 *I love sitting on my sofa relaxing, coffee in one hand, catalogue in another and I squealed in delight (yes, even I, the unsquealy, squeal from time to time) when the postman dropped in the fabulous BRAND NEW Spring/Summer 2012 Home Collection from Matalan! 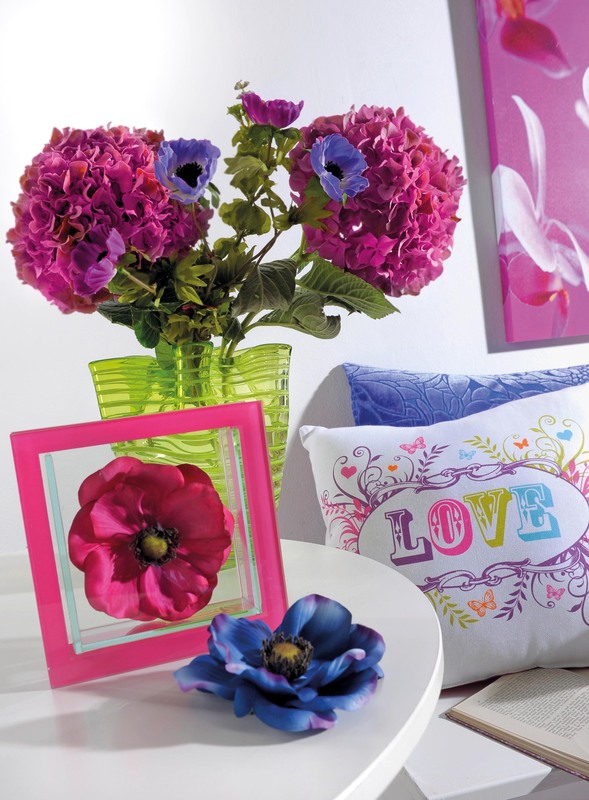 It is the most awesome sneak preview of fresh and fantastic ideas to decorate your home and Matalan have once again shown their strength of style with fantastic affordable prices that allows you to have a whole new house without breaking the bank! Whilst smiling like a fool and drooling over the pages, I decide over and over again what I want, which is pretty much everything and then some. 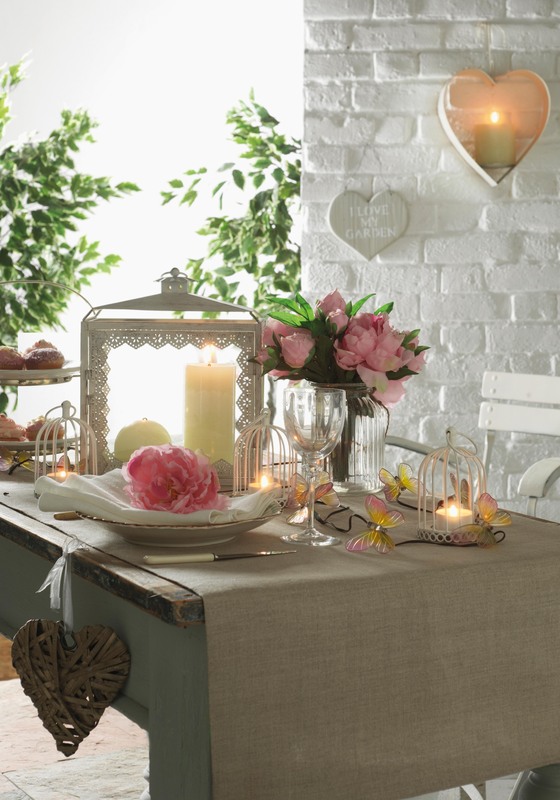 Matalan have four key themes in store for us this Spring/Summer. Vintage, Harbour, Heritage and Colour Pop. Each has it’s own strength of character with Heritage and Colour Pop giving us bold, bright and luxurious colours whilst Vintage and Harbour give us a soft, fresh and breezy outlook on decor . 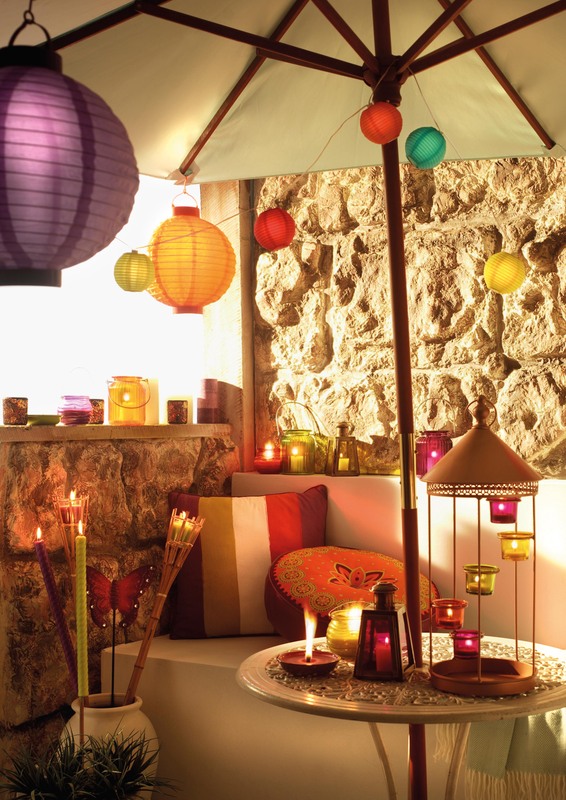 Every room in the house can have it’s own story and character with these versatile ranges. My personal favourite is the Vintage and I’ve already earmarked several pieces for our home when the range debuts across the stores but having more of a look at the catalogue I can’t stop poring over Colour Pop this year which gives us a living style worthy of Carnaby Street colours!, a fabulous rich Mediterranean look for the garden, and a warm bamboo style called Apples and Pears for the Kitchen! For such a home decor novice as myself, the sneak peek is a God send. I can picture how I want things to be where we are now, and with plans to move house in the next couple of years, these timeless designs are easily transportable. *extras* as well. At least that’s what I’m going to tell The Husband. So if you’re in the mood for updating your collection or fancy re-doing rooms, here is an exclusive SNEAK PEEK for you too so that you can start making those plans to have fabulous new stuff for your home this Spring/Summer! *This is not a sponsored post. All words and opinions are my own. Because it’s half term this week, you would think I would be busy doing lots of activities with the children so that they wouldn’t flake out in boredom. We started with a lovely lunch at the weekend at my parents, then a trip to the Science Museum on Sunday, followed by severe illness on Monday. My youngest was struck down with some kind of mysterious virus that rendered him feverish and sick. Needless to say all the plans we had (bar the chocolate cake making) went out of the window. Tuesday came Valentine’s Day and although we don’t celebrate it as a couple, we had a few moments of nostalgia whilst waiting for the little one to awaken and throw up (as you do). This year, we will celebrate 9 years of marriage. We are wondering where the time has gone and can barely remember the time before children (is it like that for everyone?!). We joked that we’d like to have the wedding day again as it was just so much fun. We had two weddings…yes two, and both on the same day plus we were so lucky to be able to celebrate with all our friends and family that we don’t get to see alot nowadays that it would just be the perfect excuse for a get together. So two weddings, I hear you say…well with me being Iranian, and the husband being English, we just had to mix a bit of both so we had a Church ceremony in the beautiful St. Wilfred’s Church of England in South Manchester and we had the Sofreh Aghd (Iranian wedding Ceremony) in the hotel before the reception. Now I have lived in England for most of my life and therefore handed over the whole wedding organisation to my mother who gave me and the husband the best day and memories to last us a lifetime (thanks mom!) and I could never hoped to have had the Iranian side of things without her knowledge about what needed to be done. 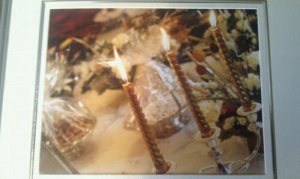 Here I thought I’d share some of the photos of the *Sofreh Aghd* (sofreh=table, aghd=marriage), and try to explain a bit about this very old and traditional ceremony which dates back to the ancient Zoroastrian times. Please forgive the photo quality as I can’t take the photos out to scan properly. Our *Sofreh* layed on a raised platform on the floor. On the Sofreh, there are several different things layed out all with their own significance. 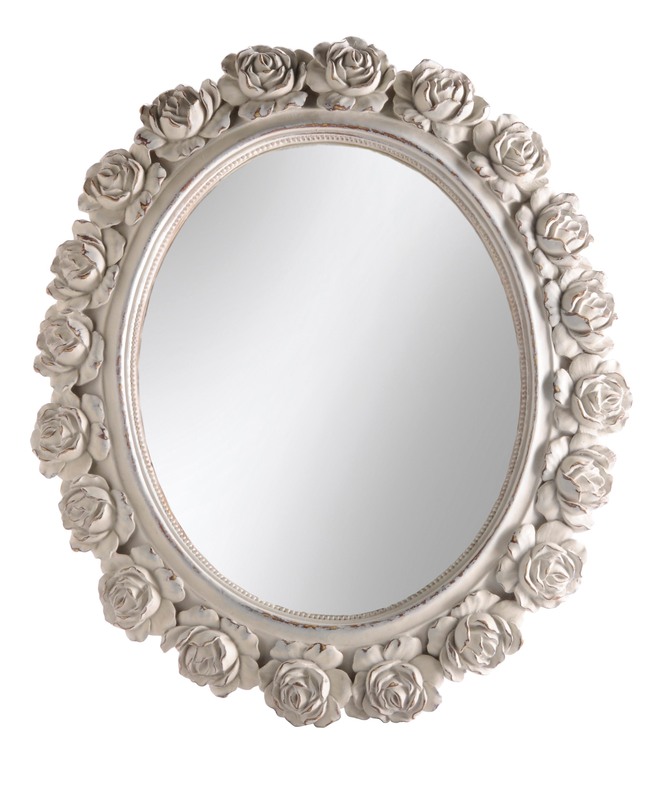 A mirror (called the Mirror of Fate) with candles on either side represent fire and light. The bride comes in veiled to sit next to the groom who are both sat on the side of the sofreh opposite the mirror. When her veil is raised, her reflection in the mirror is the first time the groom sees her face (at the wedding of course). Herbs and pastries are always present on the sofreh. The herbs can include poppy seeds, angelica, frankincense, nigella seeds and tea leaves. Rice is also present. The pastries include rice cookies, almond cookies, chickpea cookies, marzipan shapes, baghlava (layers of filo pastry with nuts and syrup) and noghl (a white sweet). 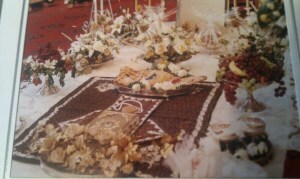 These pastries are taken after the ceremony and served to the wedding guests. Fruit, decorated eggs and nuts, better known as symbols of fertility and the heavenly fruits (apples, pomengranate and grapes). A cup of rose water for the perfume. Shakh e Nabat – a bowl made out of rock candy or any shape available. Honey-after the ceremony, the bride and groom dip their little fingers in the honey and feed it to each other. Incense to ward off the evil eye. Gold or silver coins to represent prosperity and wealth. The sacred text of choice. A Prayer rug or traditional Iranian *Termeh*. This is a rug placed in the middle of the sofreh to remind the couple of the importance of God and prayer. This can be coupled with rosary beads and a prayer stone. and groom’s head typically by the single women of the family to *bag themselves a husband* as well as pour sweetness over the newly-wed couple. On a funny note, these ladies might also sew in a stitch or two which is said to bind the mother in law’s tongue against any nasty words in the future! 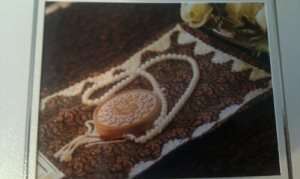 After the religious representative conducting the ceremony has finished, he then asks the bride three times if she wishes to marry the groom. For traditional reasons I haven’t found out yet, she isn’t supposed to say yes until the third time. Generally, the mullah gets heckled by female membes of the wedding party. He will ask if the bride will take the groom, the female members will shout something silly like *the bride has gone to collect flour from the mill*. After the third time, the bride will say yes upon the blessing of her family (which is already given of course) and the clapping and cheering begins. In the spirit of true Iranian and English tradition, the rest of our wedding was the same as any other. Much celebration and partying with music, food, dancing and cake! As in most other eastern traditions, the cake knife is *stolen* (in our case by my sister in law) and isn’t given back until the groom hands over some money. I’m pretty sure the husband was fleeced of about £100 that night by a couple of different girlies who took the knife! The cutting of the cake for us was memorable too as we had NO idea there was a board under the decorative part of the cake to stop it sinking in (we had a very soft sponge and cream cake) and therefore couldn’t cut it. Dissolving in tears of laughter and embarrassment, we were rescued by a friend of the family who just happened to be a baker! flowers and other bits were made here. 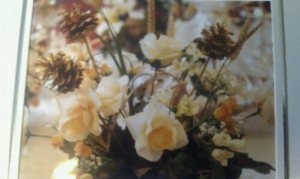 We picked pine cones from parks that had fallen on the floor, washed them and sprayed them ( I still have them all) and I can still remember the smell of the gold and silver sprays in the house in the weeks up to the wedding! The wedding also holds a huge and special memory for me as my grandmother got to see me get married. 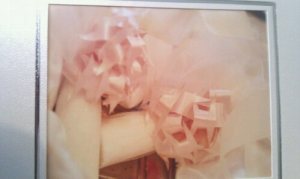 She had given my mother the tradional Iranian Termeh (prayer rug with stone and beads) and sugar cones many years before for my wedding whenever it may be on the off chance she wouldn’t get to be here. I am grateful to the powers that be that she was here for our big day and we got to see her one last time in 2005 and late last year she passed away. I am not sure I can write anymore now as the memories have flooded my mind and the tears have started. I hope you like the pictures and this little insight into an Iranian wedding and yes, if I could, for more reasons than one, I’d do it all over again. From the earliest time that I can remember, my parents have always had a fruit bowl out in the open where we could pick and choose something to eat at any given point. I can remember it was always full of apples and bananas if nothing else, and other seasonal produce…ok, I’m not THAT old but when I was a kid, you didn’t get the all year-round fruit choice that we have nowadays! I wasn’t a big fruit lover as a child, it was more of a chore but my father always pushed me to eat with the same mantra all the time. Fruit is good for you, it will make your skin shine, will make your hair shine and I was always rather skeptical of this and therefore ate as little as possible! One fruit that I did really like and enjoy though, was an unfamiliar round object that my grandmother would bring over on her trips to England from Iran. She would have a bag of them in her suitcase (something that would in no way be allowed now!) and she would pop them in the fridge until we were all together. When we finally were, she would bring them out with a huge chopping board and cut them into large pieces and I remember dark red juices flowing onto the board while she portioned them on plates for us all to eat. The ‘Anar’ as we knew it was a delicious sweet yet tangy treat that we would only have when grandma was here. We even had different ways of eating it. My father would crush the fruit without breaking the skin and when he was satisfied it was soft enough, he would bite out a bit of the skin and drink from it! My mother would take all the little jewel like bits from the inside, separate them from the pith and place them into a bowl, sprinkle salt or sugar (depending on her mood) over it and eat it all with a spoon. For my untrained hands, I would just bite the whole thing spitting out bits of peel and getting very red in the process! *The beautiful Pomegranate is said to be native to Persia since ancient times and cultivated in surrounding areas such as Pakistan, Afghanistan and North India. It was also introduced to Latin America and California in the late 1700’s. 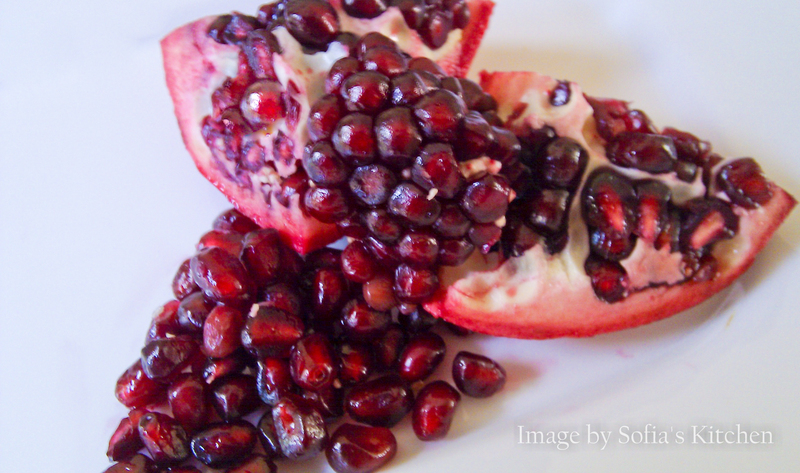 Nowadays we can find Pomegranates in most supermarkets and in a variety of different ways. You can find cartons of juice and also fruit packs that contain a handful of little ‘arils’ (the tiny jewel like fruit pieces of the pomegranate). Indeed we now know more about the medicinal benefits of the Pomegranate, for example, the juice provides 16% of an adults daily vitamin C requirement and also is a good source of vitamin B5. It is also said to have antioxidant properties but proof is yet to be found regarding this. Perhaps it really does make your hair shine!! Another tradition in Iran when having guests around is to serve a drink upon their arrival. After travelling in the hot sun for hours (getting from one side of the city to the other in Tehran traffic can take well over an hour!) 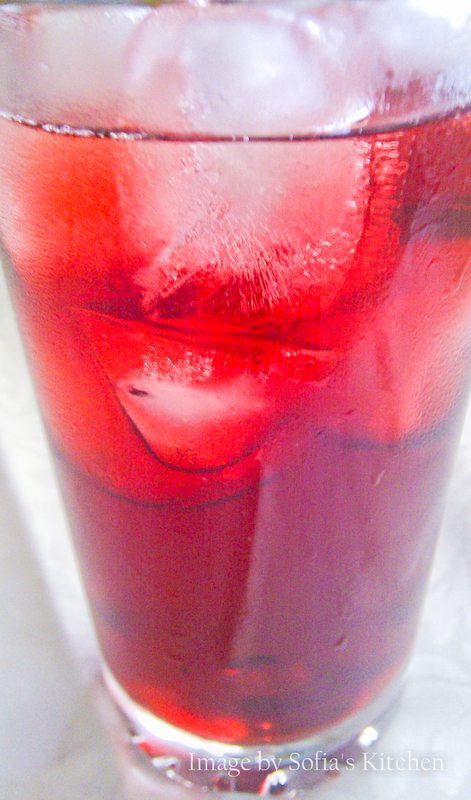 you want something cool and refreshing to strip away the heat. 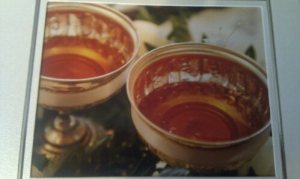 Strangely enough, hot tea is served alongside tall glasses of ice cold juice made from a thick syrupy concentrate of either lemon or pomegranate as well as other varieties. At the moment, the concentrate is not imported into the U.K but you can find Pomegranate puree in most Asian stores around the country which will do the trick. A tiny amount in a tall glass with water and ice topped with a sprig of mint gives a very refreshing taste on a hot summers day. It is also widely used in Persian cooking. The arils can be used in soups and salads or the more popular dish of Khoresh e Fesenjoun. This is an extremely thick casserole of chicken in a very tangy sauce of pomegranate puree and crushed walnuts. My personal favourite however is the Northern Iranian dish called Gilasheh. Chicken livers sauteed with onions in a sauce of tomato and pomegranate purees and demerera sugar. For an added extra, you can sprinkle in a teaspoon of cinammon and serve with Iranian flatbread (nan e lavash) or the Arabic Khoubz (again, both found in most Asian stores). I have added the recipe here for Khoresh e Fesenjoun. Be warned that this is a very time consuming dish and not for everyone’s palate. Definitely not one to try with younger children as they may not appreciate the sweet and sour taste this dish exudes. You should end up with a very dark, thick casserole of almost a dark purple colour. 1. Sauté in 4 tablespoon vegetable oil until golden brown. Take extra precaution to not burn the onion or have the edges black. Once complete, strain onion from the oil. Discard oil. 2. Mix the finely crushed walnuts and water together. If it is too thick, add a little more water until the consistency is ‘runny’. 3. In a large casserole pot, over medium-high heat, bring the walnut mixture to a gentle boil- constantly stirring to prevent settling of the walnut on the bottom of the pot and also to prevent the mixture from boiling over. Again, add cold water to the mixture if needed to create a runny consistency. Bring the heat down low and continue to stir for an hour. 4. Add onions to the mixture and continue to stir. 5. Add ½ tsp. salt and pomegranate puree to the walnut mixture and continue to simmer over low heat. Again continue to stir every thirty minutes to prevent settling of the walnut at the bottom of the pot. Allow mixture to boil for 3 hours to allow the walnuts to exude its natural oil. The finished consistency should be similar to runny porridge; if not, add cold water to the mix until a runny consistency is achieved. If the mixture has too much liquid, continue to boil until the excess liquid evaporates. 6. Add sugar (to taste) to the mixture and continue to simmer. 7. Meanwhile, in the same frying pan, heat remaining oil and lightly brown chicken pieces. Sprinkle turmeric and remaining salt. Do not fully cook pieces. 8. Add chicken and all of the juices and oil to the walnut mixture and continue to cook for another hour. 9. Taste the walnut mixture and add more salt or sugar to taste. Serve with white rice and/or pitta or khoubz bread and slices of fresh onion to complement. *Taken from various sources on the internet.